WOODHAVEN - Don't chop Woodhaven. That's the word from a community group outraged by a newly proposed revision to the City Council's district map, which would carve the neighborhood into three sections. 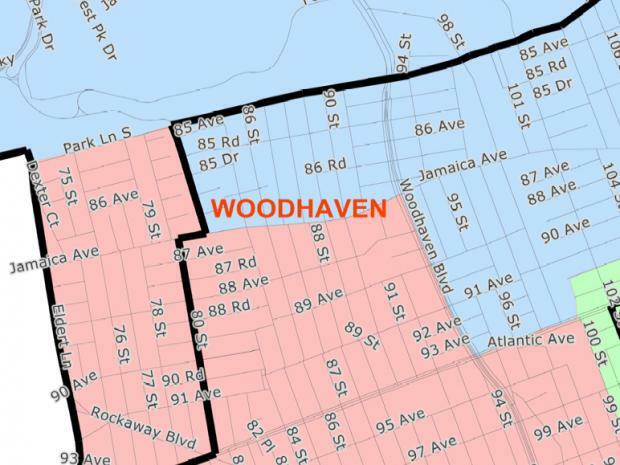 Members of the Woodhaven Residents' Block Association condemned the redrawn map on Monday, arguing that the lines, released Nov. 16 by the city's Districting Commission, further divide a community that is already split in two. "The commission decided to throw Woodhaven under the bus," said Alex Blenkinsopp, the block association's director of communications. "It should be embarrassed about how its final proposal treats our community." His group is especially angry that the map deviates from the commission's initial proposal that was unveiled in September — and would have reunited the neighborhood into a single council district. Block association president Ed Wendell said the new lines, if approved, would require up to 80 percent of the community to switch council districts. "This is going to create an added level of confusion," Wendell said. "It's very frustrating." The City Council and the federal Justice Department still must sign off on the proposed district map. Currently, two-thirds of Woodhaven is in District 32 and is represented by Councilman Eric Ulrich. The remainder is in District 30 and is represented by Councilwoman Elizabeth Crowley. The new lines divide Woodhaven at 80th Street and at Park Lane South, effectively chopping the neighborhood into three pieces: Crowley's district to the west and northeast, and Ulrich's district in between. The WRBA submitted testimony during the public hearings on the changes, urging the entity that redraws City Council district lines every 10 years to unite Woodhaven. The Districting Commission's president, Carl Hum, said the panel tried to take into account every community's request. “Over the past several months, the commission listened carefully to the advocates and community groups. But one of its greatest challenges is that not every request can be honored," Hum said.